The first African American artist to gain international notoriety, Henry Ossawa Tanner, the son of a prominent cleric, was born in Pittsburgh, Pennsylvania on June 21, 1859. At age 13, inspired by an artist painting a landscape in a local park, he committed himself to a career in art despite his father’s initial discouragement. Entering the Pennsylvania Academy of Fine Arts in 1879, he was influenced by the revered painter, Thomas Eakins, and developed his own introspective, empathetic realist style. 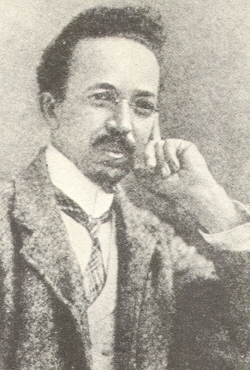 For quite some time Tanner had wanted to work in Europe where there was greater racial tolerance and where he could expand his artistic horizons, but his modest success as an artist in Philadelphia and as a photographer in Atlanta, Georgia, prevented him from earning enough money to cover his transportation costs to cross the Atlantic. Tanner’s situation changed in 1891 when, with the assistance of two benefactors, he set off for Paris, France and enrolled in the Academie Julien. Illness curtailed his first experience in Europe and he returned to the United States At the World’s Columbian Exposition in Chicago, Illinois in 1893 he exhibited “The Banjo Lesson,” one of his best known works, which featured an elderly black man instructing a boy to play the banjo. His success in the U.S. using blacks as subjects in his painting allowed him to return to Paris where his painting The Music Lesson qualified him to exhibit in the Parisian Salon. The stunning success of his first major religious work, Daniel in the Lion’s Den (1896), brought more international recognition. For decades this was the only painting by an African American exhibited in the Louvre in Paris. Tanner’s other major paintings included The Resurrection of Lazarus (1896), Nicodemus Visiting Jesus (1899), and Two Disciples at the Tomb (1905), which is now part of the permanent collection of the Art Institute of Chicago. All of these works were celebrated award-winners that firmly established his lasting reputation as a painter of religious themes. In 1909 Tanner was elected to the National Academy of Design. Later he worked for the Red Cross during World War I. Henry Ossawa Tanner died in Paris on May 25, 1937. In 1996 President Bill Clinton requested and received Tanner’s “Sand Dunes at Sunset, Atlantic City” as part of the White House permanent painting collection. Notable Black American Men Vol. 1. Detroit, MI: Gale Research Inc., 1999; American National Biography Vol. 21. New York: Oxford University Press, 1999. Internet Site: http://www.artcyclopedia.com/artists/tanner_henry_ossawa.html.